The Press Complaints Commission has issued new guidelines for undercover reporting, after a court case involving the phone-tapping of royal staff. The PCC began an inquiry after a News of the World journalist and a private investigator were jailed for tapping the phones of the royal household. It said it was satisfied no-one else at the paper knew of the phone tapping. 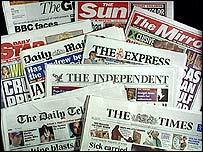 But it said newspapers should improve staff training and ensure contributors comply with data protection laws. The press watchdog began its investigations after journalist Clive Goodman and private investigator Glenn Mulcaire were jailed for illegally accessing voicemail messages on phones belonging to members of the royal household. The court case revealed that Mr Mulcaire received more than £12,000 in secret payments from Mr Goodman. The newspaper's editor, Andy Coulson, resigned over the case. In its report, the PCC described the actions of Mr Goodman and Mr Mulcaire as "deplorable", but it added that undercover investigative work remained "an honourable tradition" and played "a vital role in exposing wrongdoing". To prevent a repeat of the case, the press watchdog says newspapers and magazines must ensure their journalists understand the legal requirements of undercover reporting. It wants to see regular internal training regarding privacy cases and compliance with the law. There should also be rigorous control over cash payments to outside contributors, it says. And compliance with the Press Code of Practice and the Data Protection Act should be an explicit part of every contributor's contract whether or not they are on the staff, it adds. "Undercover investigative work has an honourable tradition and plays a vital role in exposing wrongdoing. It is part of an open society," the PCC report says. "But it risks being devalued if its use cannot be justified in the public interest." The watchdog went on to warn against "overreaction" following the Information Commissioner's recent recommendation that the penalty for a journalist breaching the Data Protection Act should be increased to two years' imprisonment. The impact of the new initiatives should be assessed before the government proceeds with the proposals, the PCC said. It added: "Such a move would be difficult to reconcile with notions of press freedom."